Wistariahurst is dedicated to preserving Holyoke’s history and inspiring an appreciation of history and culture through educational programs, exhibits and special events. Listed on the National Register of Historic Places, Wistariahurst is the former home of William Skinner, a prominent silk manufacturer. Wistariahurst Museum, originally the home of prominent silk manufacturer, William Skinner and his family, has stood as an example of elegance and fine architecture since 1874. The buildings and grounds were owned continually by the Skinner family until 1959, when Katharine Skinner Kilborne, the youngest child of William and Sarah Skinner, and her heirs gave Wistariahurst to the City of Holyoke for cultural and educational purposes. 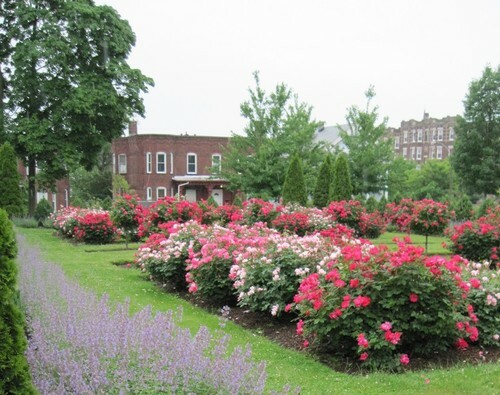 The magnificent Wistariahurst gardens are maintained by the Western Massachusetts Master Gardener Association and the Wistariahurst gardeners. Come and give yourself the opportunity to take self guided tours of the garden and landscape. Spring 2015 - Work at Wistariahurst Museum started early this year. Three trees were removed in mid-March. The wood and brush were removed and taken to the dump in early April. We cleaned the grounds, pruned the Roses, and pulled up the pots that were ‘heeled’ in for the winter. 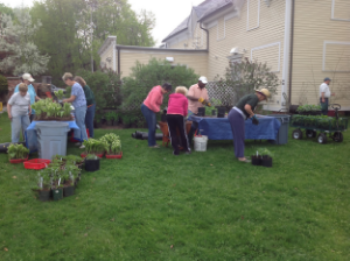 We re-potted the plants in preparation of our plant sale May 16. As the plants grow, we divide and repot them as needed. This year we are also growing some new plants from ‘plugs’. These 1500 hundred new plants had to be potted, then re-potted as they grew. The pepper plants are now on their 4th re-potting alone. This year’s Interns are wonderful to work with as they accumulate their community service hours helping us prepare for the plant sale. And we always have a good time. October 21, 2014 - Wistariahurst Volunteer Gardeners (including Toi Graham, MG on the left, and Phyllis Barrett, MG on the right) met with Holyoke Mayor Alex Morse. 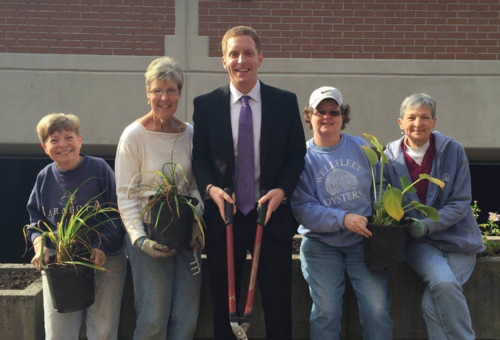 This was in appreciation of their donation of plant material and their labor to fill the concrete planters on Suffolk Street in Holyoke at the refurbished parking garage. Great Job!! June 6, 2014 - Was the annual Wistariahurst Gala. The Peonies were beginning their beautiful display along with the Roses. The weather was beautiful that evening for strolling on the grounds. There was a good turnout for the champagne and elegant hors d'oeuvres under the tent on the lawn.